Filled with summer flavours, this pasta salad is sure to please both friends and family alike. Cook pasta in large saucepan as directed on package, omitting salt and adding beans to the boiling water for the last 4 min. ; drain. Rinse with cold water; drain again. Place in large bowl. Add chicken, pineapple, celery and nuts; mix lightly. Mix Miracle Whip and dressing until blended. Add to pasta mixture; toss to coat. Refrigerate 1 hour. Stir gently before serving. This easy-to-make salad can be stored in the refrigerator up to 24 hours before serving. 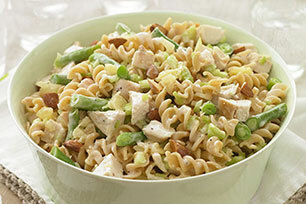 The balsamic dressing adds the perfect touch of sweetness to this flavourful pasta salad. And as a bonus, the salad provides a high source of fibre.